Within It – POETRY. IMAGE. FICTION. Friday, October 3 – Thursday, October 30, 2014. DreamBox Gallery and Cup & Spoon present a dialogue about multicultural identity within our neighborhoods and beyond. Voices of poets, writers and artists will contribute to cultural exchange and provide a deeper understanding of the experience of ‘otherness’. Lidia Rozmus is a Polish born artist, living in America and following her passion for Japanese wabi-sabi aesthetics. 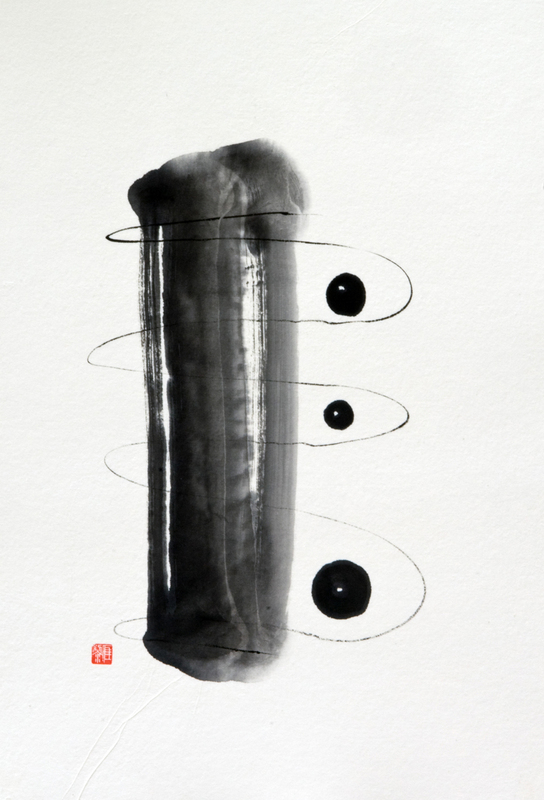 One Brush Stroke series of sumi-e and haiga paintings evoke a feeling of meditative pause in the moment that goes beyond the artist cultural borders and finds balance within multicultural experience. This kind of painting is closely associated with Zen Buddhism and relies on simplicity of thought, action, and form to create works of understated beauty. Lidia Rozmus exhibition is a continuation of WOW Frequency – DreamBox Gallery’s collaboration with Cup & Spoon. Sharing a vision of showcasing emerging and established artists, DreamBox Gallery and Cup & Spoon fuel the community with energy, art, ideas and conversation. Poetry and flash fiction will be presented in the garden of DreamBox Gallery.